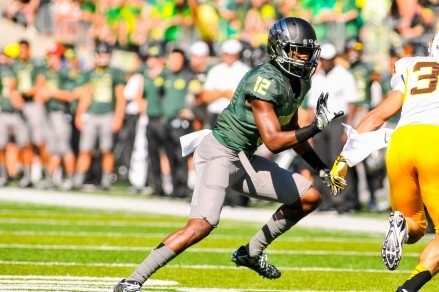 — Cut to promising RS freshman, Chris Seisay — standing on the sidelines, unable to do anything to help his team. He watched as hopes for a future national championship diminished. Until half-time came around, that is. Heading back into the locker room, secondary coach John Neal dropped an unexpected bit of news: “Get ready, you’re going in.” Seisay was about to play in one of the biggest games of the year — giving reserve corner Dior Mathis some much needed relief on the field, Seisay was a better match for MSU’s larger receivers. Chris Seisay at the Wyoming game. His impact in shadowing those receivers showed immediately. The Spartans went completely scoreless in the second half, allowing the Ducks to come back for a huge win. But who was this unsung hero playing in only his second college game? Seisay grew up in American Canyon, California, attending its namesake high school. There he played a wide variety of roles on the football field, earning his ranking of “athlete,” come recruiting time. As a three-star recruit, Seisay spent time on the O-line and D-line, as well as a stint as the American Canyon Wolves’ punter, where he held an average of 40 yards on 26 kicks (1,077 yards overall). As a junior, Seisay pulled in 26 catches for 756 yards and nine touchdowns. He also returned 10 kickoffs for 280 yards and one touchdown. He did some great work on the defensive side as well, with 73 tackles (of which 56 were unassisted). Four INTs for 172 yards and a score, were also notable. These contributions earned him Newcomer-of-the-Year honors on the 2011 all-Napa County team. But Seisay didn’t sit back and rest on his laurels. For the majority of his senior year, he played safety and wide receiver. And Seisay still managed to showcase his ability to play cornerback, despite spending so much time at other postions. He was credited with 92 tackles (67 unassisted), deflected 10 passes, intercepted two others, forced another two fumbles and recovered one loose ball. All that earned Seisay the Vallejo Times Herald Defensive Player of the Year and the MaxPrep Division II Second-Team All-Star Defender. While Seisay had already received recognition for his rounded talents, he continued exploring new positions. Offensively, Seisay caught 28 passes for 608 yards (an average of 20 yards) and 11 touchdowns. Additionally, he carried the ball six times for 93 yards and one score. This earned him a spot on the All-League Second-Team Offense. His contribution to the Wolves’ 11-2 season caused head coach Ian MacMillan to name Seisay MVP. So, how did this successful, Californian athlete come to the Land of Green-and-Yellow? 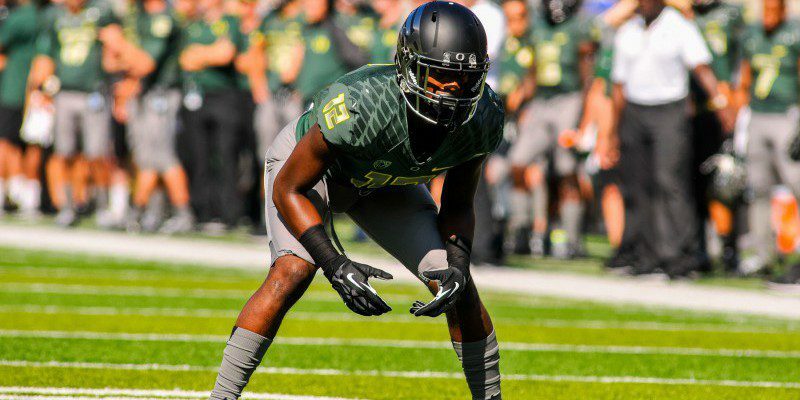 On the road to becoming a Duck, Seisay attended an Oregon summer camp, where he stood out as the Defensive Back MVP. He ended that camp session with a scholarship offer from the Ducks. And after a successful redshirt year on the scout team, he was added to the secondary rotation for 2014. Seisay ended up premiering at the spring game with three tackles and one pass break-up. However, while the spring game holds importance, it was nothing compared to the Michigan State game. 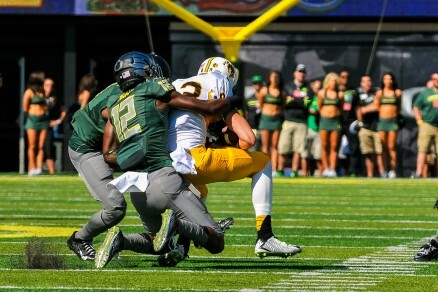 Seisay (12) making a tackle during the Wyoming game. You never know what can happen, indeed. If Seisay can continue to make an impact during big games, he could be the next All-American corner at the U of O. But, for now, Seisay tells us he will try to do his best to make an impact in the game. Only time can tell what this already devoted football player will become.